When I was originally contacted by the nonprofit for help designing the school, I did my first design proposals in SketchUp. It's fast, I used it before I joined the Peace Corps, and the renderings it produces are easily understandable by laypeople. Once we settled on a concept and started to develop it, I began showing plans and sections and elevations to the village elders and the local masons. It became clear early on that these types of drawings were causing a lot of confusion. In the US, we've spent centuries formalizing a system of presenting design data, and everyone in the construction industry has been trained to read plans, sections, and elevations. In the third world, though, most construction is done by semi-literate craftsmen with a good intuitive sense of what works, but no experience with drawings. 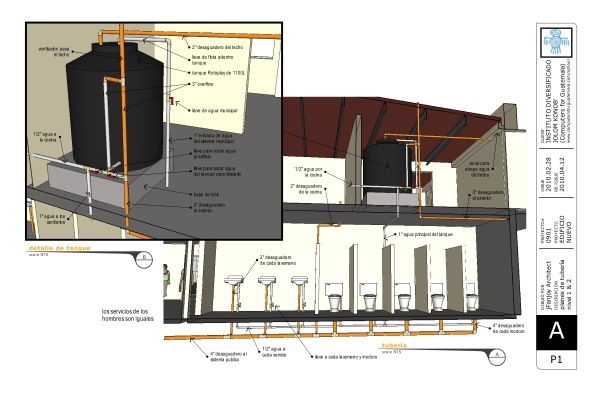 And on a two-level, 8,000sf school, drawings were going to be necessary. Spanish is a second language for all of us (the masons speak Q'anjob'al, a Mayan dialect), so I thought that the language barrier would be the biggest problem. Instead, I had to present the entire set of drawings in a non-traditional way that could be understood by the work crew. Using SketchUp, I modeled the building in much more detail than I normally would for design visualization. Using axonometric and three-point projections, carefully placed section cuts, and a lot of layers, I made drawings that show how the building would look during different phases of construction. Complex systems, like the plumbing to catch and contain the rainwater for domestic use, are presented in perspective for easier visualization. Zoom-in details are presented only where they are critical, so the craftsmen will have the flexibility to use their traditional knowhow where it can save materials or labor. The various scenes from SketchUp were then brought into LayOut, so they could be labeled and printed out for the workmen. 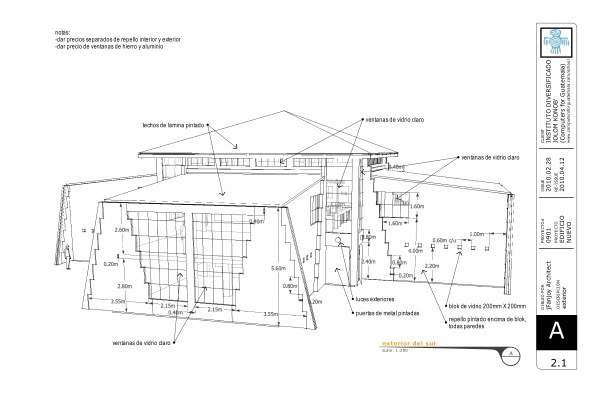 Since SketchUp can be found in almost any design office, it also makes a good communication medium between consultants. I emailed my SketchUp model to an engineer in the US, to get his feedback on a few structural issues. My village is located on a remote mountainside in the highlands, and we have no phone lines or mail delivery. Via cellular internet and SketchUp, I had his response the next day. 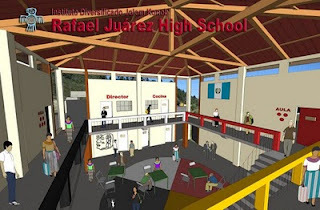 SketchUp is also helping during construction. 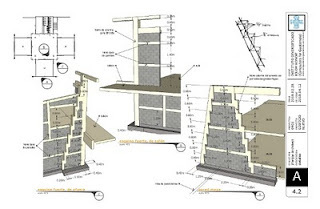 When there was some confusion on how to lay out the decorative "Mayan stairs" on the ends of the classrooms, I modeled them in more detail and dimensioned all the critical masonry measurements. I had the drawing to the masons the next day. 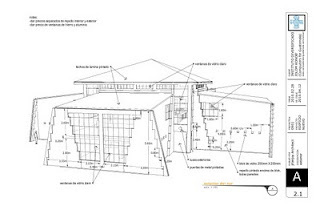 For more information on the project, you can visit the project's website and you can see reports of the construction progress on Jim Fanjoy’s Peace Corps blog. Jim, thank you for sharing all the information about your use of SketchUp on this project. This work is amazing. The design, the layout and the models.